Utah’s fourth-ranked gymnastics team continued its unprecedented start to the 2019 season on Saturday as the Utes handily defeated No. 21 Oregon State 197.15-195.5 in Corvallis. Utah frequently has struggled in the home of its Pac-12 rival, but not on Saturday as the Utes instead broke the 197 mark for the third straight time. This is the first year the Utes (3-0, 1-0) have opened the season breaking the 197 mark in every meet. The Utes were led in the win by junior MyKayla Skinner, who won the all-around with a 39.625. She won the vault (9.975) and uneven bars (9.925) and had a 9.9 on the floor and 9.825 on the balance beam. The balance beam title was shared by four gymnasts, Maela Lazaro from Oregon State and three Utes in Cristal Isa, Kari Lee and Adrienne Randall, all of whom earned 9.85. Utah coach Tom Farden was happy with the Utes’ performance, particularly since it came a week after the Utes had a slow start in a 197.25-196.475 win at BYU to have a closer than expected meet. The Utes opened with a 49.175 on the bars on Saturday, led by Skinner’s effort and 9.85s from Isa and Missy Reinstadtler. Skinner then led a big effort on the vault, where she continues to flirt with perfection. The defending NCAA vault champion, Skinner earned a 9.975 on the event Saturday. In Utah’s previous meets she earned 9.95 and 9.975, respectively. Lee and Macey Roberts had 9.875s in addition to Skinner’s 9.975 for a 49.4. While the Utes were soaring on the vault, Oregon State posted a 48.95 on the bars as only two scores were 9.825 or higher. Utah’s effort gave it a 98.575-97.9 advantage at the halfway mark. For the second time in two weeks, the Utes earned a 49.4 on the floor, led by Skinner’s 9.9. Her score was no surprise; after all, she earned 9.95s in Utah’s first two meets on the event. But what was good for the Utes is that four others earned 9.875s, starting with leadoff Roberts. Reinstadtler, Sydney Soloski and MaKenna Merrell-Giles also had 9.875s. Utah’s floor score all but wrapped up the meet for the Utes as Oregon State struggled on the balance beam, scoring only 49.275. The Beavers had to count a fall and had just one score, a 9.85 from Lazaro, that was above 9.8. 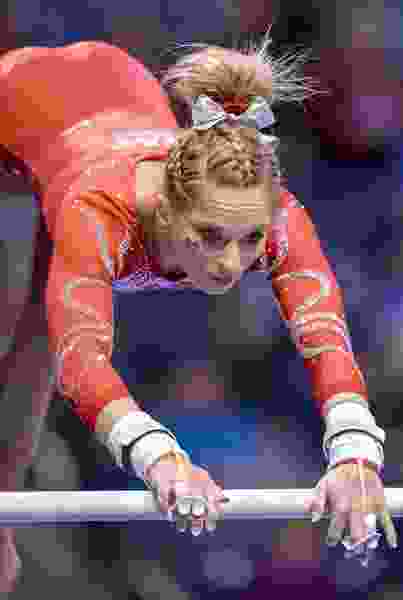 The Utes’ only misstep came on the balance beam, where the usually steady Merrell-Giles slipped during her flight series and fell hard on the beam. She finished the routine, but scored only 9.075. It was the first fall of the season for Merrell-Giles, who is 136 of 144 in hit routines in her career. Her rare miss gave freshman Randall an opportunity to prove herself in a pressure moment and she came through, scoring 9.85. Utah continues its road swing with a meet at Arizona State next Saturday. In short: MyKayla Skinner won the all-around and the Utes took an easy win at Oregon State, a place where they have struggled in the past. Key moment: After MaKenna Merrell-Giles fell on the balance beam, freshman Adrienne Randall got the Utes back on track with a 9.85. Key stat: Utah’s score was the best it has earned in Corvallis, where it is 18-9 against the Beavers.